Warning signs! Caution tape! Army fatigues! Zombie makeup! 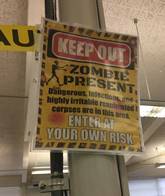 All for the sake of teaching students the geographical regions of the United States using a breakout box with a zombie apocalypse theme. 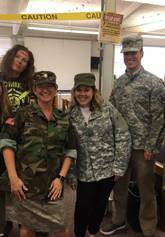 The game began when students were introduced via video to General Greene (aka our principal) who gave students the mission to find the anti-zombie medication by collecting clues from each box. All levels of students had a great time reviewing and teachers were able to assess individual student understanding before the summative test. Luckily for the students, they survived the day, but it took a few days for my zombie make-up to wash off! The game was not just about to assess content; it was also about providing the opportunity for students to be assessed in the abstract competencies. During our zombie breakout box, we assessed students on the difference between the regions of the United States and on their ability to work together. In our new AASL Standards under the shared foundation of Include and the domain of Share we find a call for tolerance and empathy. Students should be "engaging in informed conversation and active debate," and "contributing to discussions in which multiple viewpoints on a topic are expressed" (AASL 2018). 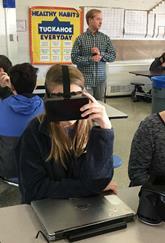 Gaming not only makes content and assessment fun for students, but also is a showcase for new national library standards and an advocacy tool for keeping our libraries open and accessible to all students. Before moving a class of students into any type of whole class game situation, clear procedures must be established by the teaching team and library staff. These rules must then be clearly communicated to students with posted procedural instructions appropriate for their ages. At times, my library will have seventy students. How will I get their attention without losing my voice? If your school or classroom teachers do not already have a quick way to get students' attention, this would be a time for you to establish such a system. At my school, we raise our hand and ask students to "Give Me Five!" All students are to then raise their hands, stop their task, and give attention. Other examples would be to use a bell or whistle or maybe even dim the lights. Props could also be used, like a whisper wand, to lower voices or magic sunglasses might mean it is time to work individually. No matter what your strategy, it must be clearly communicated and consistently utilized. Control can turn into chaos very quickly when playing games with a class. Next, comes identifying your library tables or stations. Flexible seating and spaces are fantastic, but it can be confusing for students who are stepping into a new configuration each time they enter the library. My students put their backpacks along one wall and then line up along a strip of masking tape on the floor. This gives me time to set up in between classes as well as assess student groups before they sit down. When working with a classroom teacher, discuss student groupings; he or she may already have teams in place or may already use a random group creator such as Class Dojo. Table tents (signs) with a number, location, color, or other indicator work well for me. I do my best to name the table something to do with the theme of the game or unit. For instance, one theme was Star Wars, so each of the tables was a different character from Star Wars indicated by a table tent with a number, photo, and name of the character. Expectations of purpose should be clearly communicated not only to the large group but also at each table. Each table should have directions for the table's task, so students can direct themselves. There are many great tools on the Web for helping students visually understand what is happening while they are gaming. Online-stopwatch.com has creative timers to help students stay on task for the entire time period. ClassroomScreen.com has many tools including a timer, traffic light, volume monitor, random name picker, and drawing board which help students to visually understand the expectations of behavior. Discuss with your collaborative teacher(s) behavior expectations as well as levels of discipline that will be available. I would also suggest a "time out" table be set up. When students are having difficulty with their collaboration skills, it is good to have an alternative space for students to go—not as a punishment, but as a place to work individually on a puzzle or game related to the content. Be sure to include a strategy for students to buy their way back into the large group. For example, "Complete this clue for your group and you can rejoin them." All of these steps will help students have a more enjoyable experience and keep them on task to meet the objective of the game. Although there are many examples of games which can be included in classroom instruction, three games which can be applied to any content are: Quiz, Quiz, Trade; Breakout Boxes; and Makerspace Challenges. Quiz Quiz Trade is a strategy from Kagan Cooperative Learning. Step 1. Stand-up, put hands-up, then pair-up with someone else who has their hand up. Step 2. Partner A quizzes. Step 3. Partner B answers. Step 4. Partner A coaches or praises a correct answer. Steps 6. Partners trade cards and raise hands to find new partners. Step 7. Repeat steps 1-6 a number of times. From this strategy you can assess students informally both on content and job skills while watching students interact with students they may not usually choose as a partner. Breakout boxes can be built for any content area and are an escape room for the classroom. Breakout boxes work great if you can work closely with a content team to create puzzles, riddles, or activities for different tables. Once students work together to solve the initial activities (worksheet, puzzle, or riddle), a teacher will check their work. If the team has solved the activity correctly, they get a clue card which will help them figure out the answer to the lock. Each table has a box with a lock that has a part of a puzzle or a further clue inside. Students open the box, get out the puzzle piece, relock the box, and move to a table they haven't visited. As students collect all the pieces, it will lead them to one final clue. If they solve the final clue first, they are the "winners." Breakout boxes require a lot of prep work, but are a great break from the "regular" classroom content and valuable in any content area. Another creative break from traditional classroom work are makerspace challenges related to classroom content. This game idea is about moving the makerspace beyond a place for students to create and posing authentic challenges where students solve content-based problems. Although there are many ideas to get you started on Pinterest, I recommend Challenge-Based Learning in the School Library Makerspace by Colleen Graves, Aaron Graves, and Diana L. Rendina. At our school, when working with a sixth-grade U.S. history class during the frontier unit, students created an invention to help pioneers as they moved west. Students met in teams, brainstormed problems of the pioneers, and created a prototype invention using Tinkercad. 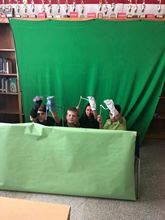 After having the prototype approved, students used the green screen to create a commercial advertising their new product. Next year my goal is to incorporate the language of the new standards competencies into the rubric so students are assessed not only content knowledge but also their skills as learners. My school uses the Positive Behavioral Intervention and Supports (PBIS) system for rewarding student behavior. I often google "PBIS reward ideas" to get lists of free and innovative rewards for students who win. Ideally I want to students to love learning and enjoy the gaming process, but as you know, we are teaching kids who need an extrinsic motivation to participate in the game. Some of my favorites are fast pass in the lunch line, makerspace pass, DJ for lunch, choose your seat, secret handshake, fidget spinner time, board game time during lunch/recess, and sharpie marker usage. Gaming in the library is not a new concept. We probably all have a stack of UNO cards and a chess set sitting on the shelf. However, I challenge you to increase gaming as an academic strategy to not only assess students in content areas but also to teach the inquiry, collaboration, and engagement skills of our new national standards. AASL. National School Library Standards. American Library Association, 2018. Graves, Colleen, Aaron Graves, and Diana Rendina. 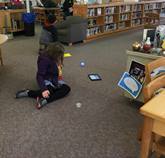 Challenge-Based Learning in the School Library Makerspace. Libraries Unlimited, 2017. "Kagan Structure: Quiz, Quiz, Trade." YouTube, uploaded by Lee Rebel Tech, 16 Dec. 2013, youtu.be/o4n60DpwYOg. Positive Behavioral Interventions & Supports. https://www.pbis.org/. "Tuckahoe MS Escape Room." YouTube, uploaded by Henrico Schools, HCPSTV, Sept. 29, 2017. youtu.be/dY1RXkipkOA. Here is an example from the United States History 1 class of their clues from each box: https://docs.google.com/document/d/1VgBIwWTekAHRXU2GEiUrvFvBp_Fg0OE6pqscbsvr1Mo/edit?usp=sharing. Calypso Gilstrap, NBCT, is a school librarian at Tuckahoe Middle School in Henrico County, VA. She has been a school librarian almost nine years. Before that, she was an English and speech/drama/debate teacher for seven years at various high schools. She has taught in the library media education program at the University of Central Oklahoma and loves presenting at a variety of technology and library conferences. follow her on Twitter at @calypsogilstrap. MLA Citation Gilstrap, Calypso. "Glad You Game to the Library: Using Games to Teach and Assess 21st-Century Skills." School Library Connection, December 2018, schoollibraryconnection.com/Home/Display/2148471.